The materials to construct the new water tank above Tamarac Village in water district No. 3 were on site earlier this month, awaiting installation. In a report to the town board February 14, supervisor Patti Littlefield, said she had attended a meeting that day with the contractor and officials from the Development Authority of the North Country (DANC), who are overseeing the project for the town. “It was on site late last fall, but then the weather got the best” of the installers, she reminded her board. She said the heavy equipment to erect the sections of the tank arrived on site that day. The installers hired to construct the tank were expected to begin this past Monday, she said. The process of filling the tank with chlorinated water involves a lot of back washing and cleaning and testing” before it is ready for use, she explained. She said also at the meeting were members of the village line crew for discussions on where new utility poles would be installed to service the tank complex. The tank will be connected by antenna to the other two village tanks to coordinate the flow of water in the village system. The pad for the new tank was poured by the contractor, North Country Contracting last fall. The “substantial completion date” for the project is the end of May, according to the supervisor. The contractor will have to do “a little tidying up” on the road next to the No. 3 and No. 4 fairways where the new water mains were installed last summer, she said. Next Stop! Tupper Lake, the local not for profit organization, which built and operates the Tupper Lake train station, has been notified by the Adirondack Foundation that it has won a grant of $1,843 through its Generous Act program to add a new lighting system to the dimly-lit interior of the station. The grant application was written and filed by Dan McClelland, chairman of the train station group. The money comes from community-minded donors to the Lake Placid-based foundation, whose investment profits are put back into the community for myriad good works. Money is also given to the Foundation by many friends of the Adirondacks to be distributed to worthwhile community projects. “We are delighted with the help of the Adirondack Foundation. Its generous gift will go a long way to making substantial lighting improvements inside our station, and in particular to better show off the exhibits of our new tenant, the Tupper Lake Heritage Museum,” Mr. McClelland said this week. “When we built the station ten years ago, we underestimated the amount of lighting we needed in the great room for events there,” he noted. Three chandeliers provide most of the interior lighting in that section of the station. Last summer after problems developed with the physical condition of the town's old Pine St. firehall the Next Stop! Tupper Lake board welcomed the Tupper Lake Heritage Museum to the large room of its building. Over the winter museum volunteers have been organizing and building exhibits of Tupper Lake historical artifacts for a June re-opening. Museum Chairwoman Kathleen Lefebvre and several of her board members and Mr. McClelland are currently working with lighting professional David Naone of Tupper Lake to purchase the best system for the money. Mr. Naone has identified three good systems and has recently briefed the museum board on those. Some of tonight's meeting of the museum board is expected to center on his recommendations. Mr. Naone has directed the lighting for numerous Tupper Lake High School musical and dramatic productions in the school auditorium over the years, giving generously of his time and talent. He also advised on the new lights installed in the high school auditorium, as part of the recent capital improvements this past year. 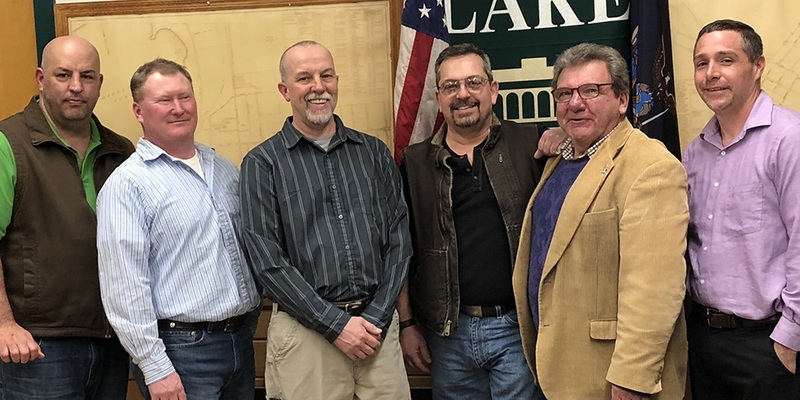 On Monday at noon the Tupper Lake Village Board presented to the public a draft of financial plan that will guide the village's operation in the fiscal year beginning June 1. The only people in attendance were the mayor and Trustees Clint Hollingsworth, Ron LaScala and Leon LeBlanc, along with Treasurer Mary Casagrain. The proposed budget, which must be finalized this month likely after several work sessions, forecasts total spending this coming year of $3.048 million- a figure up by $83,016 or 2.79% over the current year. The proposed budget covers spending in only the village's general fund which covers the operations of the village staff at the Park St. headquarters, the village fire and police departments and the department of public works (street and sidewalk detail). The village electric and water/sewer departments are funded for the most part by ratepayers of those utilities and do not affect the village tax rate. In the preliminary plan, after $100,000 in unexpended balance from the current year is rolled forward and after revenues from other than taxes of $942,131 are applied, the balance of spending that figures into the calculation of the total tax levy in the village will be $2.005 million- or up by just shy of two percent (1.976%) from the total village tax levy this year. If the budget is adopted without substantial alteration later this month by the board, the plan would produce a total tax levy of $58 below the state's permanent 2% tax cap which for the village this coming year will be $2,005,997. In prospect for the village's 2019-20 financial year is a total tax valuation in the village of $141,759,758 which will produce a tax rate of $14.51 per thousand assessed valuation, based on this year's spending. The amount of assessed property to share the tax burden next year (village tax base) is up by $274,344 from $141,485,414 this year. The proposed tax rate of $14.15 is up by 25 cents per $1,000 from the current rate of $$13.898 per $1,000 or an increase of 1.78%. The village tax rate five years ago in 2014-15 was $13.331 per $1,000. Based on a house in the village assessed at $100,000 village taxes were $1,333 per year then. This coming year that owner of that same house with the same $100,000 assessment will pay $1,415 in total village taxes, $82 or six percent more they did five years ago. It seemed like early every Tupper Lake child gathered at L.P. Quinn in the late moments of the morning of Saturday, April 6, to participate in the Erin Farkas Dewyea Easter Egg Hunt. There were kids and eggs as far as the eye could see. Thousands of vibrantly-colored Easter eggs, each one filled with candy, stickers and toys, were strewn across the Rotary Track and Field athletic field and the school parking lot where school busses line up on a typical school day. At the strike of noon an air horn sounded marking the official beginning of the hunt which brought a stampede of little feet in pursuit of Easter surprises. While the youngest of the group scavenged the wet grass of the football field, the older kids hunted their eggs in the parking lot. Six children found golden eggs and won Easter baskets full of toys and goodies. Every child left with their baskets or bags filled eggs and a stuffed Easter bunny. On site was the Easter Bunny himself, ready to greet the kids and pose for pictures. Nolan LaQuay, Estelle LaBarge, and Abigail Boushie in great excitement hunting for eggs. Middle schoolers Rachel Sorensen, Garrett Dewyea, Lexi Sabin and Emelia Foote volunteered on Saturday to help the younger ones navigate to their appropriate easter egg hunting ground. Remi McClelland braved the cold in his snow suit that day to participate in his first Erin Farkas Dewyea Easter Egg Hunt. Frankie Tremblay made haste to fill his basket with easter eggs. Myles Carmichael had his hands full of easter eggs on Saturday. Paisley Silvia and Genevieve Arsenault rush to fill their Easter baskets. Mark Dewyea late last week withdrew his small claims legal action against the Town of Tupper Lake for the balance of veterinarian bills he owed for his tiny dog's over one dozen surgeries last year. His action came after his outstanding bills were satisfied by two anonymous donors. In August 2018 Mark's tiny terrier, Jackson Browne, was attacked in the front yard of the family's Fourth Ave. home by a German Shepherd that had escaped from a village patrol car. Village Patrolman Mike Vaillancourt and town dog control officer Wayne LaPierre had picked the dangerous dog up earlier and tried to recapture it near the Dewyea driveway after it escaped from the rear of the patrol car. The bigger dog grabbed the tiny 12-pound dog by the neck and head and nearly killed it, resulting in about $5,000 worth of surgeries at the High Peaks Animal Hospital in Ray Brook to save it in the weeks which followed. Officer Vaillancourt shot and wounded the 130-pound attacking dog, saving the smaller dog's life. On Thursday, March 14, the pet owner appeared before the town board to ask it to pay the $1,572 balance of the bills at the veterinary hospital, where the dog was cared for over four weeks. He said the reason he was putting some of the blame on the town was because the dog control officer was partially responsible for “corralling” the dangerous German Shepherd into his front yard. “If Jackson Browne had been out on the street when he was attacked that would be an entirely different thing and I wouldn't be standing before you tonight,” he told the town officials that evening. Asking the town leaders for help, he said their insurance company, the New York Municipal Insurance Reciprocal, had denied the claim he made against the village and town last year. Both the village and town have the same insurance carrier. According to Mr. Dewyea, the claim was denied by the company because neither municipality carries negligence insurance. He claimed that through the actions of their police officer and dog catcher, the village and town governments here were negligent. In reviewing the claims openly that evening Town Supervisor Patti Littlefield revealed that the village board agreed to pay $1,572 after NYMIR denied the claim. A Go Fund Me campaign generated another $325 and after the German Shepherd's owner paid a small sum and after other payments of about $625, a balance of $1,572 was left that Mr. Dewyea wanted the town to pay. After some back and forth between Supervisor Littlefield and the pet owner over the documents re-presented to her that evening, the supervisor announced she felt it would be setting “bad precedent” for the town to pay a claim their insurance carrier refused to pay. She listed some of the payments made on the bill by the various parties. Mrs. Littlefield promised Mr. Dewyea to pursue the matter with Town Attorney Kirk Gagnier and get back to him at some point. She also suggested he pursue legal action in town small claims court, which he did Wednesday, before Judge Len Young. He told town officials on March 14 he didn't want to sue the town, but the outstanding bills left him no choice if the town didn't help him. Because the local town court cannot hear a case against the town government, the decision where to hear it was referred to County Judge Robert Main. The action didn't get that far, however, as a veterinarian from the High Peaks Hospital called Mark Friday and told him his bill had been satisfied by two anonymous donors. A few minutes later Mark said he called Court Clerk Laurie Fuller and told her to rip up the paperwork against the town. Mark said Monday he was very thankful for the gifts to clear up his bill at the animal hospital and happy he didn't have to sue the town. Several members of the village board- including Trustees Ron LaScala and Clint Hollingsworth and Mayor Paul Maroun- were upset with their counterparts on the town board who didn't immediately help Mark Dewyea with some of the hospital bills, as they had done. Village officials were also upset with the town supervisor for reading all the payment amounts aloud at her board meeting. “I think the town board members should be ashamed of themselves for not making good on this small invoice that is a lot more detrimental to Mr. Dewyea than it is the town,” Trustee Hollingsworth was quoted as saying last week. He said Monday he was pleased to see the two donors step up and help the local pet owner out of a tough situation, none of which was his fault. The flurry of the temporary water easements sent to all village water customers early last week from Engineer Kevin Feuka's C2AE office in Canton created some discomfort for some people here. Trustee Ron LaScala, who oversees the water and sewer departments, acknowledged that in this report to the board Wednesday. “I'm sure you've all got some phone calls from some people who are not happy,” he told his colleagues that evening. He encouraged unhappy customers to speak with Superintendent Mark Robillard or other village administrators who understand the legal requirement. The temporary easements are necessary to give the village's contractor permission to enter customers' residence to install the new water meters/monitors. The legal documents must be signed and notarized and returned to Mr. Feuka's office before any work can be scheduled. “I can tell you as a board member that if any damage is done to someone's property during installation (of the new devices), it won't be coming out of the homeowner's pocket if it is due to the village's negligence or the contractor's negligence,” Trustee LaScala assured the community that evening. “That's been the number one question put to me,” he said of water customers' concerns. “People can relax” that the work won't cost them any money. He said the requirement came from the state Department of Environmental Conservation when it came time for the agency to license the drawing of water from the new wells at Pitchfork Pond. Village leaders were apparently caught off guard by the mandate, according to their recent comments. “The water department has undertaken a huge infrastructure project here” and the water meters are part of that, he explained. Mayor Paul Maroun said he too has received calls from some “agitated” water customers. He said there were approximately 2,400 letters sent out. Everyone who uses municipal water in the town or village got one. He said the easements expire in December 2020- a time frame which would give the village and its contractors time to finish the installations. The devices will be installed just past where the water pipe enters a property in its basement. An alternative installation will be inside a well pit in the lawn, where there is not a basement in the residence. “We are liable from the time we go in until we leave,” he said of the process. Retired water and sewer staffer Gary Drayse has been retained to supervise each installation. “No homeowner will be liable for anything...for any of the work done!” he assured residents. The mayor said they will attempt to tackle one neighborhood at a time. They will be used by the village “to track its water loss” through the entire system. Water loss is what the DEC is very concerned about, he noted. He said several summers ago the village spent weeks looking for a major leak in the village system and there was plenty of overtime rate paid village employees to eventually find it. With the new monitors, he said, that will be avoided in the future. The Tupper Lake chapter of the international organization, Dress a Girl Around the World, boasts of some dedicated and hard-working members whose hearts are behind their needles and threads. “Imagine a world where every girl owned a least one dress,” is the international organization's motto. Librarian Peg Mauer, who is a leader of Tupper Lake's chapter, told the story of the initiative to the members of the Tupper Lake Lions Club in recent weeks. The way it works, friends, co-workers, church group members, families get together for a night of sewing once a week or once a month or once a season and sew dresses for underprivileged girls in poor countries around the world. Proponents say that providing a new dress to some girl without one can change that girl's destiny. Women everywhere know that a new dress makes them feel good. So imagine never having had one! A new dress tells each girl that God loves them and that someone else loves them too- and enough to have made a dress for them. That often makes a difference in how the recipient feels about herself. Pastors in poor countries around the world report that a girl wearing a new dress presents the appearance she is well care for and may discourage would-be predators, who typically prey on these victims. A “Dress A Girl” label is attached to the outside of each new dress. It apparently sends an additional message that each girl is under the care of an organization, giving her a layer added protection from those who would seek to harm her like predators and human traffickers. In this modern day and age, it's incredible how prevalent human slavery is. “It's like a little badge of protection,” Mrs. Mauer noted that evening. The effort is part of the ministry of Hope 4 Women International, which if funded solely by tax-deductible donations given by supporters in this country and around the world. The ministry is based in Forest City, Iowa. Mrs. Mauer told the Lions she learned about the organization about ten years ago when her sister was making dresses for a large chapter in the Rochester area. Peg asked her sister to come to Tupper Lake to talk with a group of local women interested in forming a chapter. “We started making dresses in the spring of 2014 in Long Lake. Our goal there was a 100 dresses and we accomplished that. A group of amateur seamstresses started meeting in Tupper Lake in October of 2018. She distributed photos of little girls- many of them orphans- wearing little else but a couple of pieces of frayed cloth, literally held together with threads. “By making dresses for them they look like they are cared for.” She said that has a tendency to dissuade potential perpetrators who might grab and enslave them. “They look nice...they must belong to someone...I better not mess with her,” is what a criminal might think, she explained to the Lions. Mrs. Mauer brought along with her to the Pine Grove Restaurant that meeting sample of dresses the local group has fashioned. “We make dresses for girls six months old all the way up to size 14,” she explained. Many of the recipients are young black girls. “So we try to use fabric that is substantial and not flimsy.” She said that way when the dresses get wet they are neither clingy or revealing. She said the organization's biggest challenges are shipping and distribution to needy children. Such was the case recently when dresses were carried by Maureen Peroza on a recent trip she took to Haiti. She said she later learned that Maureen was going to Haiti on a mission to help poor children there and 64 dresses went along with her. She brought with her that evening pictures of the local retired elementary school teacher distributing the dresses to needy girls in that impoverished nation that shares its Caribbean island with the more prosperous Dominican Republic. Many of the dresses, she said, are distributed through missionaries working in poor countries around the world. Typically the distribution of the dresses go through local missionaries who know of the needs in each place. Mrs. Mauer said her chapter doesn't care where the dresses go, only that they find young girls who need them. The aim of that program is to provide absorbent cloth materials used by girls for menstrual purposes so they are not banished once a month to what are called “red tents,” she told the Lions. Peg said Mrs. Peroza was delighted to take the local group's dresses on her mission visit. Mrs. Mauer said that their organization ships finished dresses instead of donating sewing machines and fabric so people could make their own clothing. She explained that most of these countries are “so dirt poor” there are neither the facilities nor the electricity to make dresses. “There are so many barriers right now” for these impoverished people to make their own clothing, she added. In Haiti, for example, many people are homeless and spend their days when the tide is out on on the beach, often called the salt flats. Tarps and tents give them temporary shelter from the sun. They must move in from the beach when the tide returns. Many dresses from Dress A Girl go each year to impoverished countries on the African continent. Missionaries, individuals like Maureen and humanitarian teams hand carry the dresses there. Mrs. Mauer said she has been asked how the chapters can make enough dresses to clothe the millions of young women around the world living in stark poverty. In Tupper Lake's chapter, most of the fabric is donated. Members often canvass the local thrift shops in search of good quality fabric to buy. It's often a dollar a bag, said Mary Sojda, a local Lion who is one of Tupper's dress-makers. The dresses made here take about an hour to cut out the fabric and sew the pieces together. Often added are decorative pieces around the neckline or on the sleeves to make them pretty. Pockets and elastic waist bands are sometimes added too. Mrs. Mauer said the members also put together bags with all the materials needed to create a dress. They are used by some volunteers who like to make their creations at home. Around the country, chapter members often make dresses for American girls living in impoverished sections of the nation like some of the Native American reservations in the southwest and for people in Appalachia. This organization is devoted to the needs of poor girls. There are other ministries that cater to poor young boys. The local chapter will meet on Saturday, March 30 from 10a.m. to 4p.m. at the Goff Nelson Memorial Library for its next dress-making session. Everyone interested in helping is invited. People may bring pieces of sturdy cotton fabric with them, if they wish, as well as cutting wheels and surgers. Participants should bring a sandwich for lunch and soup will be provided. Stopping at the Tupper Arts center to view its new photographic show featuring the works of well-known Tupper Lake photographer Kathleen Bigrow is like taking a step back in time. In the gallery are over 200 images of Kathleen's works- Tupper Lake buildings, social activities, sports teams, wedding parties, major events, former residents, etc. The show is called “Thru the Lens of Kathleen Bigrow,” 50 years of Adirondack Photo Journalism. Each visitors to the Tupper Arts headquarters is given a 12-page hand-out which identifies many of the photographs on display. It also contains an order form where people can order reprints of Kathleen's photos to underwrite some of the cost of the show. It also carries a brief profile of the photographer and the art center's work with her collection, published below. “According to a 2008 Adirondack Life magazine article, in the early 1950’s a young Kathleen Bigrow, reporting for the Adirondack Daily Enterprise, decided to buy her first camera when the photographer assigned to her showed up late to a press conference that she was covering. With $300 borrowed from a local bar owner (her loan request was turned down by commercial banks), she began a long career in photo journalism. Long before the age of digital photography, Kathleen’s husband, Bert, built a darkroom in the basement of their home so that she could develop her films in time for press deadlines. “Over the years she honed her skills as an accomplished photographer. From comments of those that knew her she was a gritty no nonsense reporter who never said no to a story. In his book Mostly Spruce and Hemlock, Louis Simmons states “no record of the newspaper people of the community would be a complete without a note on Tupper’s lone woman worker in the field, Mrs. Kathleen Bigrow, who has covered the Tupper area from some 25 years for the Adirondack Daily Enterprise, and has represented the Syracuse Herald-American and Syracuse Post-Standard here for many years. An indefatigable reporter and photographer, she has earned a reputation for tireless, thorough day in day our coverage of the local news and has compiled an impressive file of photos of events and personalities in the community over the years. In 1977 she joined the staff of the Tupper Lake Free Press and was its photographer for nearly 20 years. Kathleen passed away in 2014 at the age of 91. Tupper Arts has been given a valuable resource that has historical significance to the Adirondack region. The vast photographic collection of journalist Kathleen Bigrow has been generously donated to Tupper Arts by Jim Lanthier Jr. The collection includes thousands of film images taken over the 50 plus years of Kathleen’s career. Tupper Arts has begun an effort to catalog, digitize and archive these wonderful images. In addition to protecting the collection, Tupper Arts goal is to make the collection available to the community. At the heart of the new display is photographer Jim Lanthier Jr., who spent hundreds of hours preparing for it...creating the photos from Kathleen's negatives, mounting them and sometimes framing them. The presentation was impressive. Jim furnished the art center with modern computers, scanners and printers in past months to begin the preservation project. Tupper Arts volunteer Ed Donnelly is working with Mr. Lanthier in the massive cataloguing process ahead. The show runs through April 27 and admission is free. The village board took the first step last week in beginning what could be a major records retention project that will secure important documents in perpetuity. The village and town leaders are working collectively on the project, which will be largely grant funded. At Wednesday's monthly meeting the board voted unanimously to engage the firm of K. Sickler Murphy, conditional on grant funding in upcoming months. The firm will be charged with reviewing all village and town old records, and making recommendations to both boards on what should be kept and what should be discarded. The firm was one of two companies that responded to recent bid offerings and its charge was the lowest. The second part of the retention project will involved a much larger government grant which will provide the necessary funds for a firm to scan and preserve all documents that the both governments want to retain. There is expected to be state funding ahead for the development of energy storage facilities like the one the Tupper Lake Electric Department and others have been studying this past year. At February's village board meeting Electric Superintendent Marc Staves said there has been an announcement from the Governor's office and from the New York State Energy Research Authority that money will be made available for these energy storage facilities to be built. “If we find out through our study that a facility would be worth it to us, there'll be money to get it implemented,” he told the village leaders that evening. Last year Mr. Staves and his counterpart from the Lake Placid Municipal Electric Department, Kimball Daby, began discussions with the Adirondack North Country Association's Nancy Bernstein and Professor Tom Ortmeyer of Clarkson to begin preparations to launch a feasibility study of energy storage in the two municipal electric systems. The study is seen by the four proponents as the first step in determining whether storing power during low-use times of the day in the course of a year can shave peak demand periods and loads in times of high electrical consumption like winter. In both municipally-owned electric systems, when heating and other costs in winter exceed their hydro-power allocations, the departments are required to buy more expensive coal- and nuclear-generated powers. The systems and their ratepayers pay the price for the expensive power. Tupper Lake receives bout 19 megawatts of hydro-generated electricity, which runs about four cents per kilowatt hour, before it has to buy the more expensive varieties which can run 14 cents per kw. In Lake Placid, the hydro-allocation is about 29 megawatts per month. At a meeting of the four last year Mr. Staves speculated that storing electricity with large batteries could be “a no wires” solution to staying under the 19-megawatt mark and thereby reduce costs here. Professor Ortmeyer of Clarkson's electric engineering department is something of a battery expert. Another battery expert who recently joined the college's faculty is expected to help with the project. He said that “battery technology” is advancing rapidly and the costs of acquiring the large units are coming down. Ms. Bernstein, who is ANCA's energy specialist, said these large batteries now come encased in large shipping containers for placement next to substations, like the village's on McLaughlin Ave.
Kimball Daby is aware of at least one electric facility in the region which successfully employs batteries to keep its costs down. Solar power is also used there to help charge the two megawatt systems of batteries. One of the things the study will look at for the two communities is the feasibility of installing solar fields on “Brownfield sites” or polluted tracts in each town, which can't be used for much else, Mr. Staves told the Free Press this week. In many places the electricity stored in large batteries is used to cut power needed from the grid during day-light hours when system-wide consumption is typically higher and then the batteries are re-charged overnight when energy consumption in a system is usually lower. How much can new batteries on the market store? “That's the purpose of the study,” noted the professor in an earlier interview. He also said the study would, among other things, determine the years of payback on the purchase of any giant batteries. NYSEDRA's reviewed the study group's preliminary information in a submittal in February, 2018 and invited it to complete and submit a feasibility study by late June, which it did. “There's a lot of interest in New York State in promoting energy storage,” according to Ms. Bernstein. The local group received “the go ahead” late last year and “the kick off meeting” occurred last week, Mr. Staves said this week. The work ahead now is for the two municipal electric departments to furnish its billing and use data to Professor Ortmeyer and perhaps one of his engineering students who will be formulating the data and plugging it into various formulas. Mr. Staves said there will be various energy-saving options explored in Prof. Ortmeyer's computations in the months ahead. “If the study finds its feasible” and practical to use batteries to shave peaks of usage and save the system and its customers money then the village board will make the decision to install the battery system, he explained. The forthcoming funding he spoke of a the February 20 meeting would help the village system buy and install the large batteries. The new study should also show that if battery storage works well here, it should work in other electric systems, according to the professor. At the first meeting here last year Mr. Staves said Tupper Lake derives 80% of its electricity from “green sources.” Any new battery storage system would increase that percentage. The cost of the new study which just began will likely run about $75,000 and 25% of that will come from Clarkson to advance its knowledge and curriculum about high voltage electric systems, Professor Ortmeyer said in the interview last year. Andrew McClelland, at the recent town board meeting, discusses his plans for the new building. The town and village planning board last month unanimously approved a new joint retail and service business venture at 115 Park Street that is one of several new arrivals in the uptown business district that is expected to breath new life in the place. Only volunteer Scott Snyder was absent from the seven-member board's deliberations that evening and there was only one thing on the agenda. Representing the business owners again that evening was Andrew McClelland, who with his wife, Faith and brother-in-law Pat Bedore formed the new limited liability corporation Chum House, LLC, which purchased the former Newberry building from Joy and Vin Moody last fall. Faith and Andrew's Spruce and Hemlock, which they started about four years ago at 52 Lake Street, will occupy the left hand side of the large two story building. In past weeks both sides of the building have been extensively rewired, with the addition of a third service entrance. Half of the left hand side of the building had the original hardwood flooring. Brandon Moeller of BTM Flooring resanded that half and restained it a dark mahogany stain to match new hardwood flooring he will install in the back half of the large front room, which in recent years was the fitness center. Beyond that 2,700 square foot space, there is another 700 square foot room, where the new owners hope in several years to add a mini-cafe and bakery. The decorative tin ceiling has been scraped and repainted and all of the chandeliers replaced. There will be new wall sconces every 12 feet or so. More insulation was added to the 12 foot high interior walls on the perimeter of the entire building. On the Spruce and Hemlock side, new drywall was installed by Pete Desmarais and his son earlier this winter. On the right hand side of the building next to One Group, many of the acoustic suspended ceiling tiles were replaced and more ceiling insulation was added by Andrew and Pat. New drywall was also applied to all interior walls, after they were firred out to permit the addition of more insulation by the owners. The Stacked Graphics partners will do their screen printing, embroidery and sign-making from the 2,000 square foot first floor, and expect to eventually expand production in the 4,000 square foot basement, which was high enough to use for retail sales when Newberry's was there the 1940s through 1970s. On the second floor of the building is one occupied 1,200 square foot apartment. The front apartment was gutted by previous owners, but boasts the large double-hung windows on the front of the building which offer a complete overview of the business district. The building owners hope to renovate that large three-bedroom apartment in the next year or so. A preliminary meeting by the board a month or so which began the special use permit process drew no comments from the general public in the days since, Planner Paul O'Leary reported to his board that evening. Free Press Publisher Dan McClelland noted that in an editorial several weeks he praised the coming changes, including this new joint venture, to the Park St. business district and asked if that piece could be included in the minutes of the meeting. His request was granted. Village Code Enforcement Officer Peter Edwards, who attends all planning board meetings on behalf of the village, said it was good to see new “young owners taking these buildings” and putting them back in local service. He said Mr. and Mrs. McClelland and Mr. Bedore have a grant dream and are “doing this right, taking these building which have been let go or neglected in recent years. With that the public hearing was closed by Chairman Shawn Stuart and the regular part of the meeting was opened. Volunteer Jim Merrihew began the discussion. Last month he had asked the owners to provide for that night's meeting a front view of the building, along with the signs planned there. Mr. McClelland provided the board with those color renderings, showing the existing facade, which was redone in rough cedar and cedar shake overhang in recent years. He said their drawings of the new signs that evening would be close in nature to the actual once they will construct in their sign shop once winter breaks. The Stacked Graphics sign will be made of cedar with raised letter in a metal frame, he told the planners. The Spruce and Hemlock sign next door will be a custom-cut shape, sporting the business' logo. Both signs, he said, would be above the respective doorways and be about 10 feet long and three feet high. The Stacked Graphics sign will look like old wood, whereas the Spruce and Hemlock sign will be brighter and cleaner, he told them. The lighting of the signs and the storefront will be overhead sconces- gooseneck in appearance and shedding the light downward, in keeping with the community's dark skies lighting requirements. He said the lights will be similar in design to those at Well Dressed Food down the street. The door on the Stacked Graphics side of the building will lead into the company's front office, where their clients can place orders or pick up shipments. Behind the two storefront windows, they plan to hang curtains to block the public's view of their printing and embroidery operations in the back. The partners, with the help of a machine from Kentile Excavating, moved those large and heavy production machines from the Free Press rooms to their new quarters in the past two weeks. The machines have been serviced by company representatives in the past week and are now in full operation at 115 Park Street. He said the front windows will be decorated in keeping with the changing seasons. Andrew thought his wife would lend her decorating talent to that effort and perhaps even use some of the space to promote her wares next door. “We're not opposed to possibly renting that storefront area some day,” as we move some of our operations to the basement area. That depends too on insulating and putting more heat in the underground quarters, he added. That would free up space in the front of the building on the main floor, according to the entrepreneur. This summer the building owners will be replacing the flat roofs on the two-part building with modern roofing materials and pointing up some of the exterior masonry brick which needs work. The partners will also looking at quotes this year to install a cornice around the top of the building, similar to the work done around the top of the former Ginsberg's building this fall, Mr. McClelland noted. The planning board members had nothing but positive comments to share with Andrew that evening. Jan Yaworski wondered when the businesses would be open and was told they are currently printing now at the new Stacked Graphics location. Once the new floor at Stacked Graphics is done early this month, Faith will begin moving in her inventory and new displays in time for a late-April or May 1 opening there, Andrew said. Of the three business people, he said it was good to see these young entrepreneurs in Tupper Lake. Tom Maroun and Chairman Stuart both called them “good projects” that will be good for the community. “It will be great to see the greater foot traffic” in the uptown business district that Spruce and Hemlock is bound to create, Mr. Stuart added. Andrew said his wife is excited to see how much their new location will boost sales at her already popular business. He admitted it was always a challenge to direct people to their former location on Lake Street. Mr. St. Onge said the visitors who come to Park Street to dine may also become the patrons of the new stores coming to the business district. He said the arrival of The Adirondack Store, Birch Boys and The Row will be good for everyone in retailing on Park Street. The planners wished Mr. McClelland and his partners good luck on their new ventures. The last time the Tupper Lake Middle High School’s Red and Black Players presented a musical, they captured an essence of a bygone era through vibrant and gaudy dress in Guys and Dolls. A year later, the Red and Black Players did it again, brining to auditorium stage to the 1980’s, where the clothes were baggier, the colors clashed, and ponytails were lifted straight up with billowy hair ties, or scrunchies, as we know them. Adapted for the stage from the 1984 movie of the same name by Dean Pitchford and Walter Bobbie, The Red and Black Players presented their latest production, Footloose, over the weekend on the evenings of Friday and Saturday, March 8-9 and Sunday afternoon, March 10. Possibly one of the most recognized movie musicals, Footloose, although receiving mixed reviews upon its 1984 release, has remained a timeless classic. The movie’s original soundtrack saw composer Tom Snow and lyricist Dean Pitchford teaming up with rock artists of the era like Kenny Loggins, Sammy Hagar and Karla Bonoff creating a memorable soundtrack that would survive on radio airwaves long after the movie lost its cultural momentum. The band that got to play these 80’s pop hits was made up of Liz Cordes on piano, Karin Ryan on keyboard, Laura Davison and Dave Fortino playing woodwinds, Michael Portal and Superintendent Seth McGowan on guitar, Wayne Davison on bass and Jeff LeFebvre on drums and percussion. The musical’s title track and theme has become one of Loggins’ best-known songs and is easily recognizable from generation to generation—even the generation that would bring the story to life 35 years later. Once again, as they did last fall with Aladdin Jr. and Animal Farm and last winter’s Guys and Dolls, the multi-faceted cast and crew of the Red and Black Players continue to set the tone for the quality of showmanship and production that emanates from Tupper’s theater club. The show’s leads, Noah Cordes and Sophia Martin, along with their supporting cast, Johnathan McCulloch, Sadie Johnson, Alyssah Martinez and Caitlynn Flemming—all seniors—are proof and product of this district’s art departments, which has allowed them to hone in their skills and passions throughout their high school careers and made a showing of it on the stage. Other seniors who were unseen on the stage, but integral behind the scenes as crew members were Danielle Delair, Alexia Goodwin, Patricia Bankich, Matthew Whitmore, Kassandra Sipler and Ben Jones. Meanwhile, Tupper Lake juniors Jayce Clement (who took to the stage for the first time in this production), Bryce Davison and Stephanie Fortune can be projected to lead the stage in forthcoming musicals as they fill the shoes of the seniors who will be leaving behind their place in the spotlight of a Red and Black Players’ production. Also spotted amongst the 35 cast and crew members were the young seventh graders Garrett Dewyea and Raegan Fritts, who played the parts of Jeter and Bickle, and who had previously led the fall middle school musical as Aladdin and Jasmine in Aladdin Jr.
Shae Arsenault, who played Irene, and Cody Auclair, who played Garvin, both performed supporting roles in Aladdin Jr. alongside Dewyea and Fritts. These young actors and actresses will undoubtedly continue to thrive in the creative and supportive atmosphere that the Red and Black Players provide for their next six years. 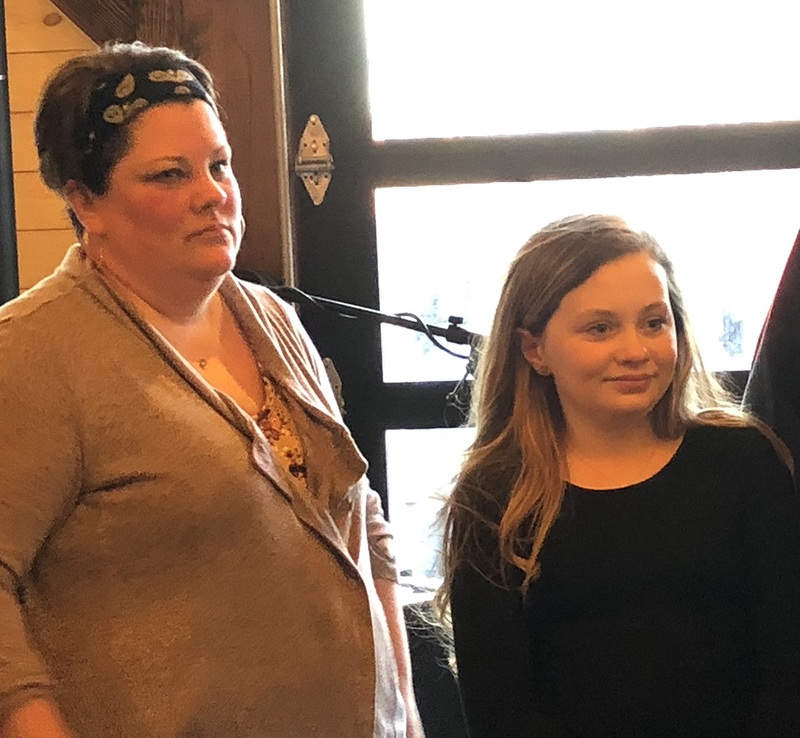 Other middle school students on-stage and off were Olivia Ellis, who played Coach Dunbar, Emily Rose Roberts who played “The Cop”, Meika Nadeau who played Wendy Jo, and crew members Genna Carmichael. Other cast and crew members include Karen Bujold who played Principal Clark, Jessica Mitchell who played Betty Blast, Lowden Pratt who played Lyle and Cowboy Bob, Nolan Savage who played Wes Wenicker, Emily Sipler who played Lulu Wenicker, Emileigh Smith who played Eleanor Dunbar, Lily St. Onge who played Urleen and Jenna Switzer who played Travis. Crew members are Johnathan Jauron, a spotlight operator, Kiana Nadeau, Zachary Smith and Molly Sullivan. While students play a huge part as stage and lighting crew, there is also faculty members, parents and community members who make the show possible and offer their support in making Red and Black Players productions happen. The man behind every Red and Black Players production—and the club’s patriarch, if you will—is George Cordes who acts as stage director, but also responsible for set design and construction. The matriarch of the Red and Black Players is Liz Cordes who is Director of Music for the production and as mentioned previously, the pit band pianist. The production’s assistant director and stage manager was Danielle Lamere. Lamere also managed props and along with Mrs. Cordes was in charge of costumes. The production’s choreographer is Emily Brown, a professional choreographer and a Lake Placid Center for the Arts dance instructor. Footlose is the third production she’s been involved in with the Red and Black Players. Brown choreographed Guys and Dolls and Godspell. Overseeing the technical aspects of Footloose is none other than Dave Naone, a former Red and Black Players actor and current Technical Director and Lighting Designer. Naone is typically known to control the lights for the show and did so with assistance from Kasandra Sipler with Matthew Whitmore and Johnathan Jauron operating the spotlights. Other special thanks goes to the mother of a former Red and Black Players actor, Dorran Boucher, Crystal Boucher who organized meals for the hardworking cast and crew. Even with her son being a graduated student, Mrs. Boucher still came out to assist with Tupper’s theater program. Special thanks also goes to other parent volunteers, the Tupper Lake Volunteer Fire Department, Maurice Fortune, Lisa Jones, Amy Lalonde, Father Douglas Decker and St. Alphonses Church, Kim Weems, Tom Dodd and the Lake Placid High School Musical Theater program, Vicki and Gloria, Amy Ferrel, Mr. McGowan, Mr Bartlett and the entire community for filling the high school auditorium with love and support throughout the weekend. You can catch the cast of Footloose perform their numbers once more on Thursday, March 14 at Big Tupper Brewing. A raffle will take place that evening to benefit the Red and Black Players.